This serene little kitty with stunningly vivid blue eyes loves to kiss (on the lips!) and snuggle up. Unlike Ashley and Toxic who are Persians, Purrkins is a Birman Cat. 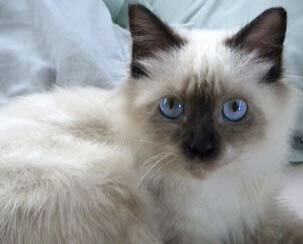 Birman coloring are similar to that of the Siamese but they are longhaired like the Persian. However, their fur are silkier and does not have an undercoat so it requires less brushing than that of Ashley and Toxic's coat.